Our visit to Florida continues to be delightful. We went to the Grand Oaks Resort and Carriage Museum in Weirsdale. There were dozens of carriages and wagons. I had no idea that shoppers in the late 1800's had almost as many choices in carriages and wagons as we do today in cars. The variety was amazing. Equally amazing was the fact that in the late 1800's they detailed their carriages much as we do today. Of course, then it was all done my hand. Then just a few days ago we went to the Edison and Ford Estates Museum in Ft. Meyer. I learned so much. We viewed a 2 hour documentary that was fabulous. I have never learned so much on a visit to a museum as I learned that day. 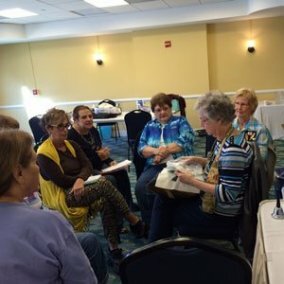 I would highly recommend both mueseums if you are in central Florida. I want to thank those of you who voted in the "My Favorite Quilt" contest. The response was fantastic. I'm already planning my next interactive quilt project. 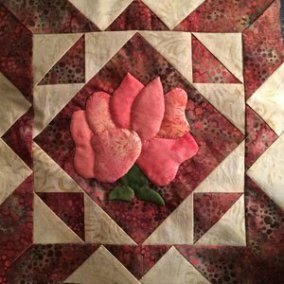 Every quilt had votes but Julie Mason's "Pushin' Up Spring" was the clear winner with almost double the votes of the 2nd place quilt of Mary Saxon - "My Christmas Baltimore". 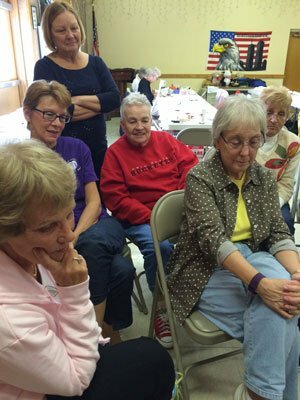 Joan Gelder's "Pushin' Up Spring" took 3rd place. 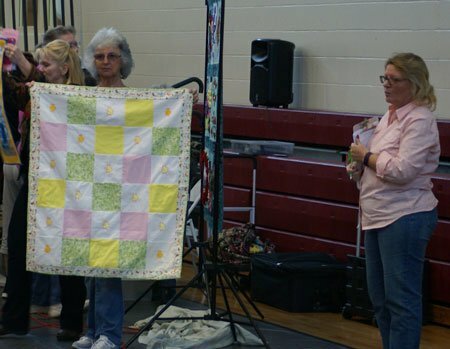 I must apologize to all of you and to the makers of the quilts in the "My Favorite Quilt" contest. I failed to bring my crib sheet telling me who made each quilt.. It's at home on my PC. I remembered a few of them including the winners but not all of them. I'll update the page as soon as we get home. 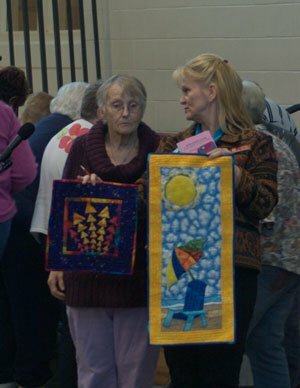 If you haven't viewed these beautiful quilts yet, I would like to invite you to do so. Click here to view the winners plus all other entries. 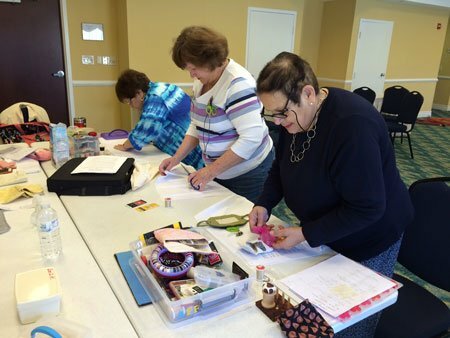 On January 14th and 15th we had a trunk show and workshop for the Martin County Quilters. 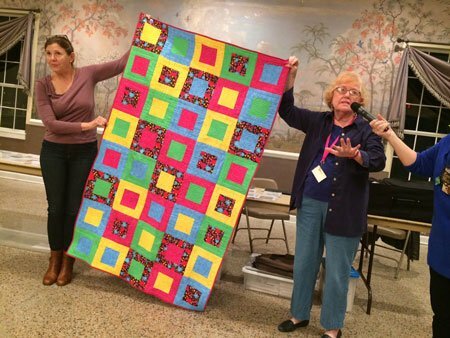 Founded in 2006, this fast growing quilt guild reaches out to a number of charities in their community including Hibiscus Center for Children, Molly’s House and Council on Aging and SafeSpace. I have had one major complaint with my new newsletter. Many of you have written to tell me that you always printed my newsletter and have kept them on file. Now you can't. I can take care of that. My son taught me how to convert my web pages to PDF files. You may be able to do it as well depending on your operating system and your browser. Pull up the web page you would like to convert to a PDF file. Pull up your print box. In my print box I have a button in the lower left that says "PDF" I clicked on that and then on the option to "Save As PDF". I have a MAC PC and use both Firefox and Safari for my browser. When I tried this in Firefox the right-hand side of my letter was cut off. I then tried it in Safari and it worked just fine. The conversion plays by it's own rules. Specifically it places page breaks where it wants to. It doesn't cut a photo in half. As a result it can waste some paper. It's one of those "what it does is what you get". For those of you who aren't able to do that, I will convert my newsletter to a PDF file so that you can download it. In the future you will find this file at the bottom of my newsletter under my name. Here are my first three newsletters. Just click on them to download the file. 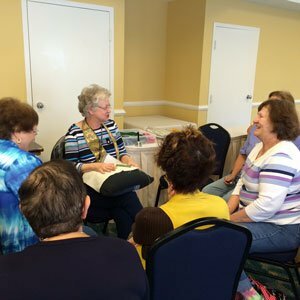 January 18th (workshop), 23rd (trunk show) and 25th (workshop) saw us in Cape Coral, Florida. 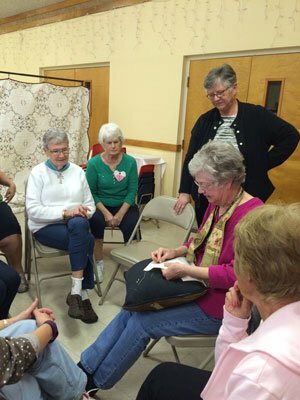 This quilt guild is a charity guild that meets every Monday. 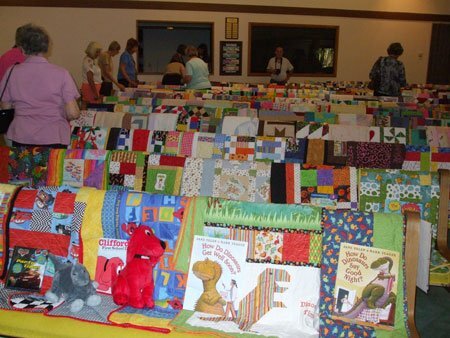 They have 200 unfinished quilt tops that were donated to the guild prior to 2016. This year’s goal is to complete all 200 and donate them to a variety of charities. When we arrived on the 18th they had already completed over 50. I have also had some confusion with my patterns. To paraphrase an e-mail: "Why do I have to print additional instructions to make a pattern?" You don't. I write all of my instructions so that the quilt can be made from the instructions. (This doesn't include single block patterns which only include the single block pattern.) Occasionally I use a new or different technique to make a quilt. When I do this I often take photos of the process. I place these pictorial guides on my web site under "Quilting Tips". Anyone can look at these tips at any time. If you have purchased one of the patterns for which I have made a pictorial guide, you may look at this pictorial guide and you may even print the pictorial guide's PDF file and place the pictorial guide with your instructions. You don't have to do this. It is strictly optional. January 21st and 22nd saw us in New Port Richey. This is a large (160 members and growing), very active guild. 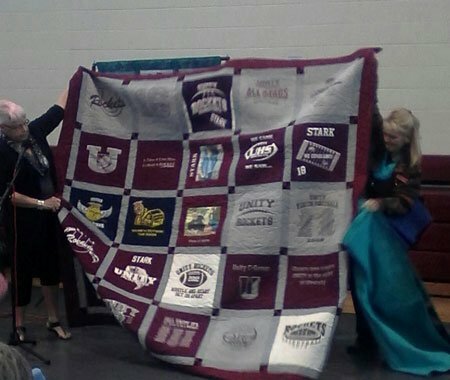 Members of the guild had made a beautiful applique quilt which they gave to one of their favorite charities. The charity is going to raffle it later this year. Karen Johnson - yes the same Karen Johnson for whom my latest free BOM is named - has just completed my last free BOM. There were 4 twirling floral blocks. I didn't provide a set. 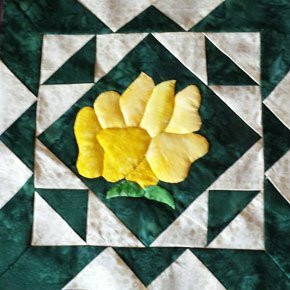 Karen chose a perfect, simple set that accented the four floral blocks. 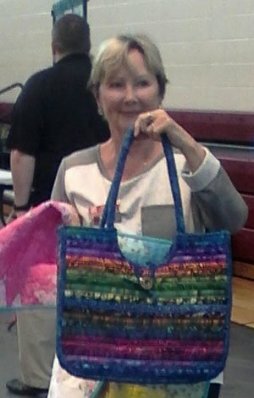 Angela Wirth, owner of the "Mended Hearts Quilting and Boutique" near Ellsworth, Ia. 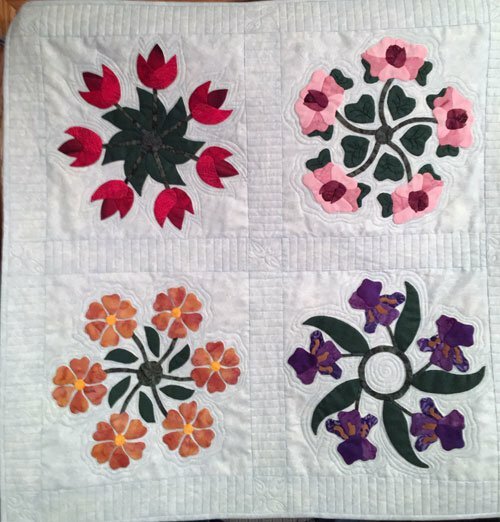 did a beautiful job with the long-arm quilting. A big "THANK YOU" to both Karen and Angela. 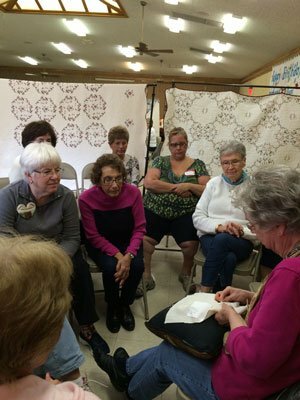 If you have made a quilt from one of my patterns won't you share it with me. I in turn will share it with my readers. Send your photos to me at abqhaidle@mchsi.com. Have you made the first block in our new free BOM yet? If you have I would love to have a photo to share with my readers. You don't have to crop it. I'll do that. Just send it to me at abqhaidle@mchi.com. 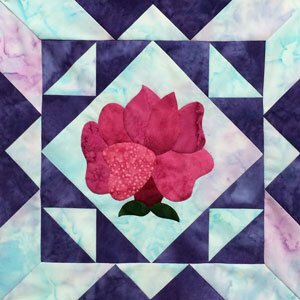 This month's block is another rose pattern. I'm also going to make last month's pattern and the instructions for the quilt available as well. There is one correction to the instructions. On the second page under "Inner Border and Sashing" the 7 - 2 1/2" x 12 1/2" should read 17 - 2 1/2" x 12 1/2" strips for sashing." As soon as I get home, I'll correct the PDF file and make it available to you next month. Block 1: My Favorite Rose 2 types of placemat fleece I used 2 layers. 1 layer was too flat. 2 layers produced a nice soft look. Block 2: Rose Hobbs 80/20 I used 1 layer. It produced a firm rose that looks nice.